According to Preszler. J. Et.al (2006: 8) frontloading provides rich dialogue and experiences that allow students to develop vocabulary by accessing their prior knowledge before reading content. When students have the opportunity to use their prior knowledge, they exhibit an increase in vocabulary and content knowledge. In addition, students show their understanding as they interact with difficult content material. Dana (2009) concludes that front-loading vocabulary provides explicit vocabulary instruction that focuses on critical words for understanding text meaning, prior to reading the text, helps to generate background knowledge relevant to the text. Meylan. D and Sturgis. L (2008: 2)states frontloading is teaching Academic Language Structures and Academic Vocabulary in order to understand and express comprehension of text. Frontloading is a powerful strategy that provides English Language Learners (ELL) and Standard English Learners (SEL) with the necessary scaffolds to answer comprehension questions both orally and in writing as well as understand text. 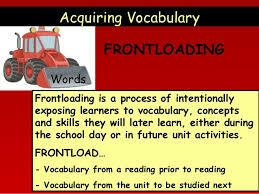 Frontloading will increase students’ comprehension skills and vocabulary, as well as written fluency. 1) Introduce content to students. Ask students to describe experiences or ideas they haveregarding the content. Ask students to list words they associate with the content to bestudied. For example, if you are beginning a unit of study on the Vietnam Era, ask students to list words they associate with that time. 2) Create a list of content words based on student suggestions and ideas. Belum ada tanggapan untuk "Frontloading strategy in Vocabulary"